MAXIM® slings are factory sewn loops and made of 100% high quality Dyneema®. They are ultralight, extremely strong and have a very low profile; making them perfect for anchors, tethers, personal protection and any other applicable use. These are the only slings you will ever need. MAXIM® slings are lightweight sewn slings made of 100 % high quality Dyneema®, with a low provile, terminated with a factory sewing to maintain high breaking force. These slings are ultralight, extremely strong, and very abrasion resistant. Their construction makes them perfect as anchor slings, tether sling, for personal protection and any other applicable use. The material and our unique construction make them unsusceptible to moisture, abrasion and low temperatures. These bomber slings are the only slings you will ever need! 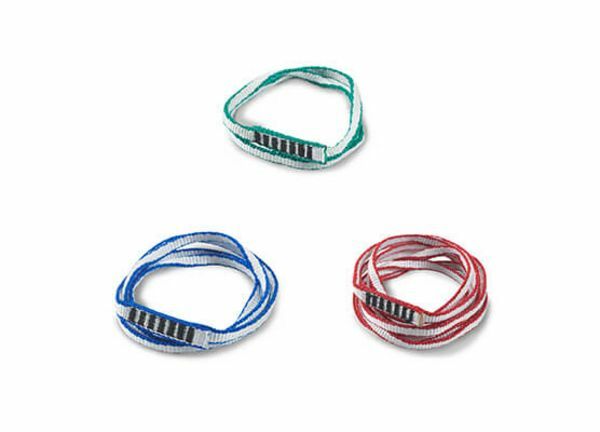 We have been manufacturing these cords for decades as high quality private label items for other outdoor brands and are proud to offer them as part of the MAXIM line. Our slings are 10mm wide and sold in small (30cm), medium (60cm) and large (120cm) pre-sewn, color-coded lengths. Color coded by length so you can always grab exactly what you need.